Digitalis is a medicine that is used to treat certain heart conditions. Digitalis toxicity can be a problem with digitalis therapy. It may occur when you take too much of the drug at one time. It can also occur when levels of the drug build up for other reasons. The most common prescription form of this medicine is called digoxin. Digitoxin is another form of digitalis. Digitalis toxicity can be caused by high levels of digitalis in the body. 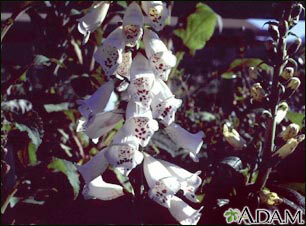 A lower tolerance to the drug can also cause digitalis toxicity. People with lower tolerance may have a normal level of digitalis in their blood. They may develop digitalis toxicity if they have other risk factors. People with heart failure who take digoxin are commonly given medicines called diuretics. This drugs remove excess fluid from the body. Many diuretics can cause potassium loss. A low level of potassium in the body can increase the risk of digitalis toxicity. Digitalis toxicity may also develop in people who take digoxin and have a low level of magnesium in their body. You are more likely to have this condition if you take digoxin, digitoxin, or other digitalis medicines along with drugs that interact with it. Some of these drugs are quinidine, flecainide, verapamil, and amiodarone. If your kidneys do not work well, digitalis can build up in your body. Normally, it is removed through the urine. Any problem that affects how your kidneys work (including dehydration) makes digitalis toxicity more likely. Some plants contain chemicals that can cause symptoms similar to digitalis toxicity if they are eaten. These include foxglove, oleander, and lily of the valley. Your heart rate may be rapid, or slow and irregular. An ECG is done to check for irregular heartbeats. If the person has stopped breathing, call 911 or your local emergency number, then start CPR. If the person is having trouble breathing, call 911 or your local emergency number. At the hospital, symptoms will be treated as appropriate. Digitoxin blood level may be lowered with repeated doses of charcoal, given after gastric lavage. Methods to cause vomiting are usually not done because vomiting can worsen slow heart rhythms. In severe cases, medicines called digoxin-specific antibodies may be prescribed. Dialysis may be needed to reduce the level of digitalis in the body. How well a person does depends on the severity of the toxicity and if it has caused an irregular heart rhythm. Call your provider if you are taking a digitalis medicine and you have symptoms of toxicity. If you take digitalis medicine, you should have your blood level checked regularly. Blood tests should also be done to check for conditions that make this toxicity more common. Potassium supplements may be prescribed if you take diuretics and digitalis together. A potassium-sparing diuretic may also be prescribed. Cole JB, Roberts DJ. Cardiovascular drugs. In: Marx JA, Hockberger RS, Walls RM, et al, eds. Rosen's Emergency Medicine: Concepts and Clinical Practice. 8th ed. Philadelphia, PA: Elsevier Saunders; 2014:chap 152. Goldberger AL, Goldberger ZD, Shvilkin A. Digitalis toxicity. In: Goldberger AL, Goldberger ZD, Shvilkin A, eds. Goldberger's Clinical Electrocardiography: A Simplified Approach. 8th ed. Philadelphia, PA: Elsevier Saunders; 2013:chap 18. Zeringue M, Fowler GC. Gastrointestinal decontamination. In: Pfenninger JL, Fowler GC, eds. Pfenninger and Fowler's Procedures for Primary Care. 3rd ed. Philadelphia, PA: Elsevier Mosby; 2011:chap 202.